Page revised in June 2010. 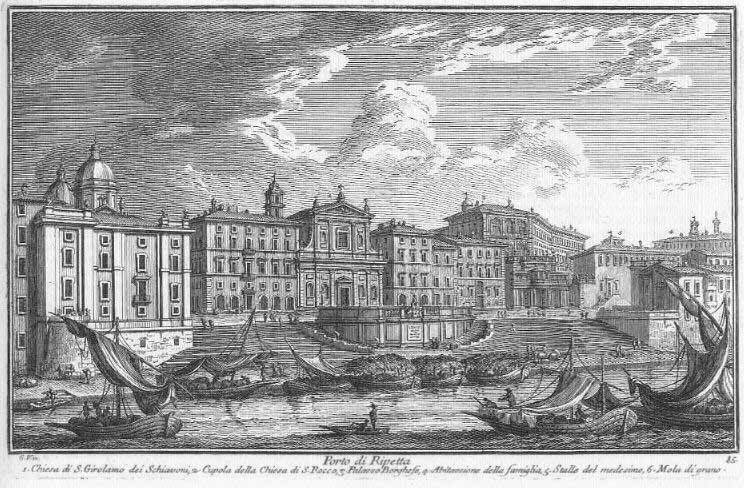 In this etching Giuseppe Vasi shows how much care he employed in depicting all the architectural details of the buildings behind Porto di Ripetta, the river harbour where commodities coming from Sabina and Umbria were unloaded; his representation of port activities lacks liveliness, because he shows the steps leading to the river almost empty of people in order to exactly depict their baroque design. The view is taken from the green dot in the small 1748 map here below. 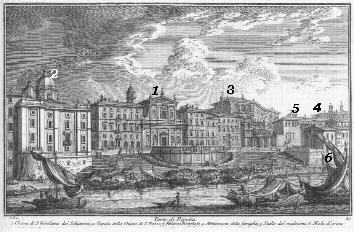 In the description below the plate Vasi made reference to: 1) S. Girolamo degli Schiavoni; 2) Dome of S. Rocco; 3) Palazzo Borghese; 4) Buildings for the servants of the Borghese family; 5) Stables of the Borghese family; 6) Mill. 1), 2), 4) and 5) are shown in other pages. The small map shows also 7) Porto della Legna and (in an enlargement) 8) Porto di Ripetta. 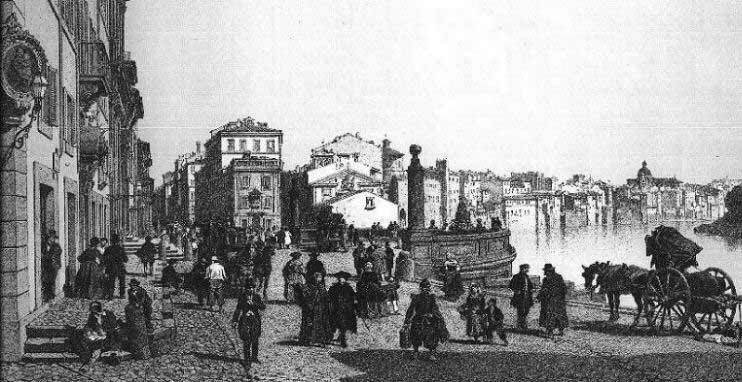 The construction of walls along the river to prevent floods and that of Ponte Cavour to link Prati, a new rione on the right bank, with the rest of the city led to pulling down Porto di Ripetta (you may wish to see a page on the modern bridges of Rome); also the buildings at the sides of S. Girolamo degli Schiavoni and those on the river front were pulled down; today the dome of S. Carlo al Corso is more clearly visible than in the past. An almost exact replica of Porto di Ripetta was built a mile to the north of the original location on a site which at the time was outside the city; it is named after Francesco de Pinedo who landed in the Tiber in a small seaplane after a long-distance flight. A sort of bronze obelisk was erected in 1974 at the place where in 1924 Giacomo Matteotti, an Italian MP, was kidnapped and subsequently killed by Fascist supporters. 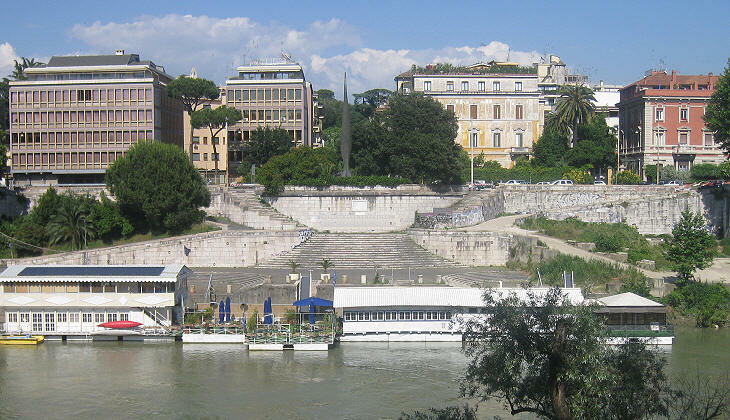 At the very beginning the river harbour of Ancient Rome was at Velabro, but with the expansion of the city small ships coming from the sea were unloaded at Testaccio, while boats coming from the Tiber valley were unloaded at Campo Marzio at a river bend which facilitated operations. 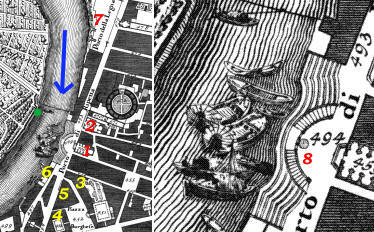 During the Middle Ages the harbour of Testaccio was replaced by that of Ripa Grande (opposite to it), whereas that of Campo Marzio continued to be used and it acquired some importance when Pope Leo X opened a street (Via di Ripetta) to link it with Piazza del Popolo. It was called di Ripetta (small bank) because it was of lesser size than the other one. 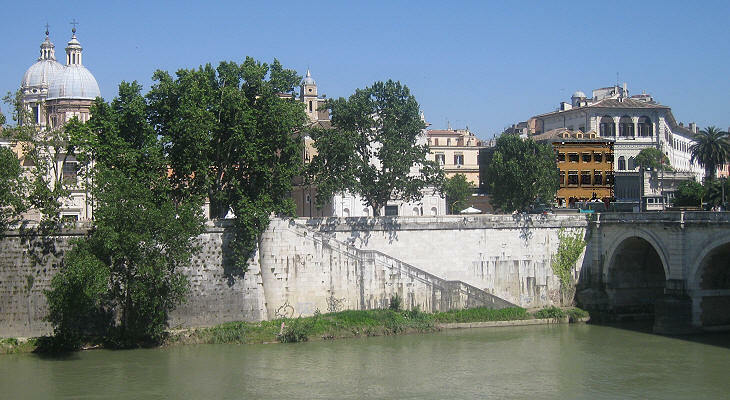 Wood was an important commodity which reached Rome from the Tiber Valley; wood for burning was unloaded and stored in a separate harbour (Porto della Legna) which was located slightly upstream of Porto di Ripetta; building timber was unloaded at a warehouse near Porta del Popolo. 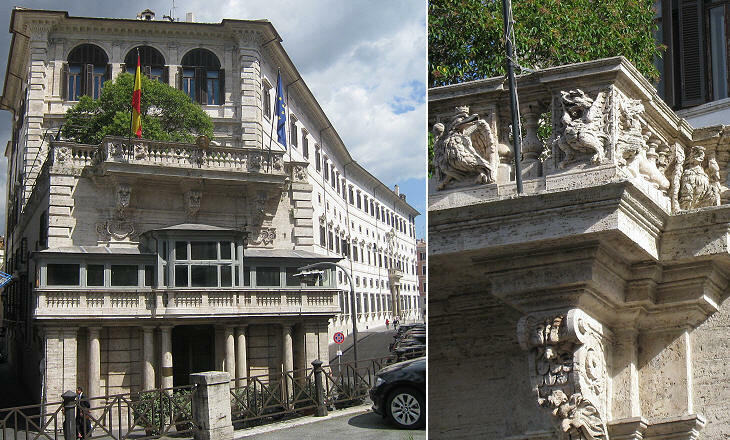 In 1703 Pope Clement XI commissioned the construction of new facilities at Porto di Ripetta; the steps were designed by Alessandro Specchi and are regarded as forerunners of Scalinata di Trinità dei Monti (Spanish Steps); they were paved with travertine blocks which had fallen from the Colosseo because of an earthquake. A fountain having the shape of the heraldic symbols of Pope Clement XI (three mountains and a star) was placed in the small central terrace of the steps; it was flanked by two columns where the heights reached by the worst floods were recorded (the image used as background for this page shows the marks for the 1495 and 1660 floods); because the fountain and the columns have been relocated to a different higher position the marks are no longer accurate. The fountain is a work by Filippo Bai, a sculptor who was also involved in the execution of another fountain commissioned by Pope Clement XI near S. Maria in Cosmedin. The "Harpsichord" is the name given to Palazzo Borghese because of its shape; its small side facing the river is called the keyboard; it was the last section of the palace to be built and it was designed by Flaminio Ponzio in 1612-14; some changes were made in 1671-78 by Carlo Rainaldi. 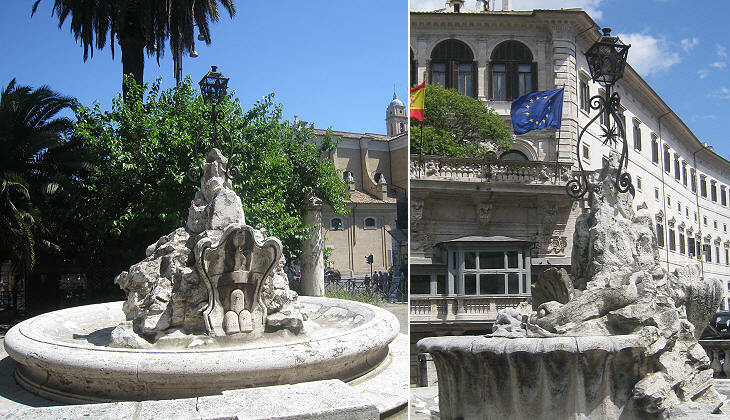 The decoration heavily relied on the Borghese heraldic symbols (eagles and dragons); currently the Spanish Ambassador has the privilege of using the pensive garden of the terrace. Porto di Ripetta Incontro alla descritta chiesa evvi il porto per le barche, che vengono dalla Sabina, e dall'Umbria, e a distinzione di quello destinato per le barche e navi, che vengono dal mare si dice di Ripetta. Perciò è quivi un continuo mercato di carbone, vino, olio; ed altri simili generi di grascie per benefizio del pubblico. Dal Pontefice Clemente XI. 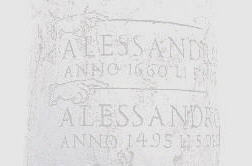 fu ornato di comode scale, come si vede, col disegno di Alessandro Specchi, e nelle colonne laterali vi fu posto il segno fin dove sono arrivate alcune volte le inondazioni del Tevere.